Key to the City - London is a game for 2 to 6 players played over 4 eras. Each player aims to develop their London borough, using tiles representing well-known landmarks. On their turn, a player chooses one of five actions. They may use their wooden workers ('keyples') to bid for, to generate resources from, or to upgrade the 57 unique and beautifully illustrated location tiles. Alternatively the player may pass, or cease playing in that era by setting off in their sailing barge along the Thames. The player accumulating the most victory points after 4 eras wins the game. 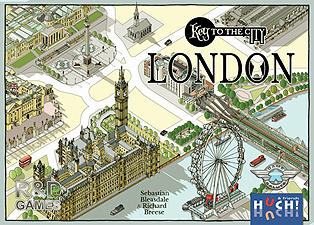 Key to the City - London has similarities to the award winning 2012 R&D game Keyflower (one of the all-time top 25 rated games on Boardgamegeek in summer 2016), but offers the new challenge to gamers of connecting the tiles in their borough. Contents include a souvenir London location booklet.